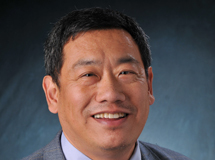 Law professor Peter H. Huang found out about the pressures of academic life at a young age. He was 14 when he enrolled at Princeton, and began Ph.D. studies in mathematics just three years later. His mother, who he affectionately describes as a “tiger mom,” set high standards for her son and one time questioned why instead of getting five A-pluses he only got three A-pluses and two As. Huang eventually studied law at Stanford University—something he did discover his joy in—and has since examined finding happiness in law school and a life in the profession. A faculty member and DeMuth Chair of Business Law at the University of Colorado Law School, he shared his conclusions—and many humorous tales of life as “a recovering ex-tiger cub”—to the first-year law students Aug. 21 as part of their week-long orientation. The presentation, “Mindset, Happiness and Law School,” focused on how improving your emotional intelligence—becoming more aware of your own and others’ emotions—and being mindful of your own development can make you happier and lead to success. Huang discussed correlations between “tiger parenting”—a nod to Yale law professor Amy Chua’s parenting memoir “Battle Hymn of the Tiger Mother” (Penguin Press, 2011) and the idea of a rigid disciplinarian parent—and a U.S. legal education, which he explored in his essay, “Tiger Cub Strikes Back: Memoirs of an Ex-Child Prodigy About Legal Education and Parenting.” He can see at times the parallel themes of fear, memorization, obedience, paternalism and shame. For example, when he was a law student, Huang was anxious that he would be called upon during class. In turn, he didn’t pay attention to what other people were discussing and missed out on valuable conversations. “If you’re overly stressed out as child or as a student, it might be counterproductive to what parents and teachers are trying to accomplish, which is helping the child or student be a better person, a happy person,” Huang says. “There’s a lot of law school professors who realize this.” And that’s why there are such resources as SU’s College of Law’s Office of Student Life, which can provide ways to direct and support students, he says. Although he has ideas as to which law field he will pursue, Albert is open to all possibilities, as Huang encourages. “It is very easy to narrow your scope and get bogged down with dates and deadlines, and lose sight of the big picture: that we are here to enrich ourselves and prepare to be well rounded professionals,” Albert says. Students can also benefit from surrounding themselves with people who will challenge them to grow and setting realistic goals for themselves, instead of seeing themselves in terms of course grades and rankings. “The only score that should matter is whether you’ve improved, you’ve gotten better or that you’re happier,” Huang says.